T.Jae Christian is one of those names. He’s one of those identities. He’s a noted songwriter, producer and accomplished performer. But don’t look for him atop the Billboard charts. You won’t find him.But that’s more to fickle wants and a herd mentality that demands arenas, block-wide tour buses and albums on discount at Walmart. This Tennessean is from the old school. Histalent comes honed of time and hardknocks. This self-made entrepreneur, who created his own label to give talent a chance, has rattled closed doors and worn shoe leather down. He’s rubbed shoulders and shared stages with legends; he’s spilt ink on tunes for known names, and he’s mentored many of today’s up and coming independent stars. Think George Jones, Haggard, Paycheck and other classic legends and you’re getting a feel for the talent of T.Jae Christian. Out now with a new album on his own label, Universal Sound Records, I Wish I Was Home brings everything that is good to the table. The album is a buyer’s delight with a generous 22 tracks. But before you presume possible fillers, think again – every track is polished, cut and perfected country. And while brash and gone tomorrow country acts lampoon and criticise the “old farts” of the genre, maybe a listen and an appreciation of what’s on offer here might serve as a needed education. T.Jae breathes life into his music. He feels the pain of hurtin’, loss and goodbye, and he sings about it in a style that is classic gold. He sings of solid family connection, changing times and memories past, all with a classy style and a clean and clear voice. It’s real country. This former European artist and producer of the year has co-inked seven tunes for the album. Engineered by Mark Moseley and held together by some A-listed musos, the album is steeped in tradition, steel and fiddle. Listen out for “The Vanishing Breed” (duet with T.Graham Brown), the Kris Kristofferson-penned “Lovin' Her Was Easier”, a tear-jerker from an earlier album “Marriage on the Rocks” and the shot glass lament of “The More He Drinks”. The current BS(helton)controversyhas, if anything, drawn attention, respect and applause to those who forged the path of modern music. T.Jae is one such person. The winds of public opinion may blow. But who cares? 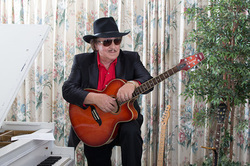 T.Jae Christian and his brand of authentic and cherished music, real deal country, will survive. To steal a song title from this release, “He’s Already Made It”.